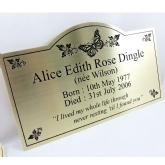 Ordering a plaque in memory of loved one can be an upsetting time but our staff are here to help you choose the best one for your needs and budget. 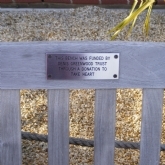 We can design the plaque for you and provide a visual layout so that you can make the decision in your own time, most people often want to consult other family members or friends. 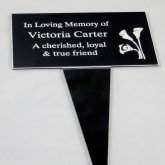 All plaques are made to order and we can advise on the most suitable materials for your needs. We can incorporate a grey scale picture of a loved one, or a symbol or graphic design such as a flower, bird, animal which has a personal special meaning in addtion to wording. Please call into our shop to view samples, give us a call or send us an e mail with your enquiry.